Above all, we would like to say thank you for your sincere greetings on Valentine's day. We hope you all had a happy Valentine's day too. pictures for the book, 'Beauty of Korea(unfixed title)'. It must be difficult challenge for him somehow, but BYJ tries to do his best with glad heart. your days are full of joy and confidence. JOB notice: Once again we would like to ask your understanding. By the notice of last autumn, we had already informed you and asked for your understanding, however, this time again we would like to tell you and ask your favor. There is a tour company which has been staking out BYJ's house over a long period of time to deliver by mail the detailed information about BYJ갽s activities, transfer pathways, destinations, his clothes, staff etc. This interferes greatly with BYJ갽s private life. Against this we have repeatedly warned the tour company, however, there has been no change yet. So again by this notice we would like to share the current situation. Taking this opportunity, we would like your understanding and cooperation so that BYJ can lead a life with his privacy protected. As for the information about BYJ, through this Japan official site, we will keep you informed as much as possible. So we look forward to your continued and warm support and understanding. Gaeulyeoja posted this on the Talk Box of BYJ's offcial home. Dear family, how are you. This is BOF. Mr. BYJ went to visit Japan in the last week. We are telling you the news because dear family might be wondering about his sudden visit. Mr. BYJ went to Japan due to shooting schedule, and he is working on planned shooting schedule. We ask your favor to deeply understand the fact that we could not let dear family know ahead of time because it was an unofficial schedule, and ask dear family's support from your heart for Mr. BYJ, visiting Japan in a long time, to complete shooting schedule in good health. We will greet you again with good news. Bae Yong Joon has returned home, today. he has completed his scheduled shooting and tasks in Japan and spent fruitful time. 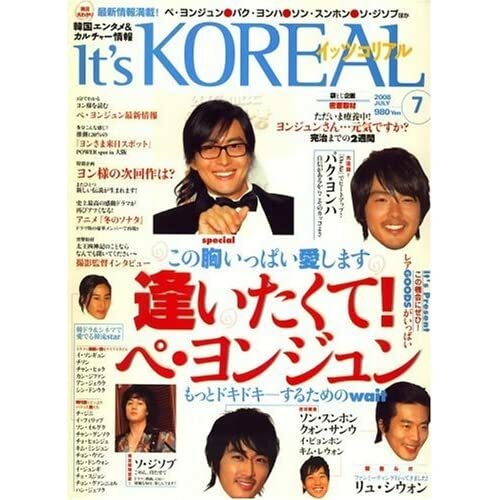 Bae Yong Joon himself was happy that he was able to gain good energy. We send our heartful appreciation to everyone’s warm heart and always showing your concern for Bae Yong Joon. We ask for your warm support till we are able to greet you again with a good news. Please spend healthy and happy days. and studied under Mr. Jun Yong Bok, traditional lacquer artist, during his Japan visit last month. many family members from all over the country have visited the museum. Mr. Jun is very happy that so many people have shown interest in lacquer culture. to re-open as a new theme-park museum to promote lacquer culture to the world. You will not be able to see inside the museum, even if you visit the museum now. The museum is scheduled to open in May. Mr. Jun is focusing his work in order to introduce lacquer to many people at earliest possible date. We ask you for your understanding and visit again after the museum is reopened.